Talk about engaged learning. Students in a world civilization class at East High School learned about the importance of human rights last month thanks to the Tanner Center for Human Rights. Teacher Lynette Yorgasen invited Aleta Tew, center associate director, and Brigitte Klement, development and marketing manager, to visit her students on Jan. 14-15 and educate them about human rights and the worldwide celebration of the 70th anniversary of the United Nations Declaration of Human Rights. The students learned about the history of human rights and of the United Nations. They then participated in discussions designed to deepen their understanding of human rights around the world, locally and personally. Tew and Klement presented each student with a copy of the Universal Declaration of Human Rights. The sophomores, juniors and seniors also were introduced to the 2019 Amnesty International’s Write for Rights campaign—the biggest letter-writing campaign in the world. The students had lively discussions about the 11 cases highlighted by Amnesty International this year and how they relate to the declaration’s articles. This year’s 11 cases focus on women human rights defenders who are under threat. The students wrote over 78 letters to government officials around the world on behalf of these women, who are in desperate need of support. In their letters, the students made connections to values articulated in the declaration—open society, democracy, inclusivity, equality, tolerance, diversity, respect and safety—putting its principles to good use. 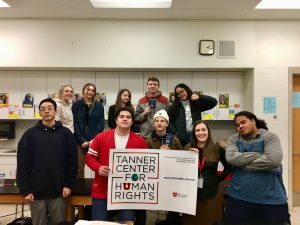 The Tanner Center is committed to promoting human rights on interpersonal, community and global levels through research, education and community outreach.